This is the tightest you'll ever get 2 or 3 LEDs together, which eliminates the annoying "Disco" effect - which is not necessarily an issue with seeing separate colors on your sandbend, but eliminates the different colored shadows that LEDs sometimes cause. This LED star creates natural looking shadows while still using your choice of colors. 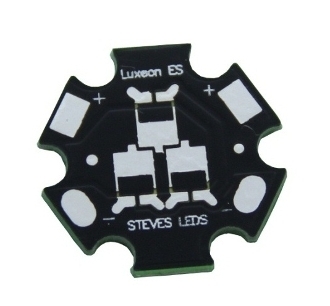 This star will allow you to have 2-3 Luxeon ES LEDs, your choice of color, on a single star, yet offers the efficiency of having the already wired in series - with a pair of positive and negative solder pads. For LED #3, you can choose to leave the LED off, or have a jumper bridge in its place. Excellent for making your very own custom LED combination! You can't get 3 LEDs closer than this!